This pen’s name is entirely in keeping with the practices of the 1940s; somewhat martial in nature. It is a name that is a little difficult to apply, though, as the differences in the US and Canadian/UK production lead to confusion. The fact that both variants occupy the same low rung in each line up doesn’t help. The US model has a single cap band, and is distinct from the Starlet 352V, which is of course a short “lady’s” version of the same thing. 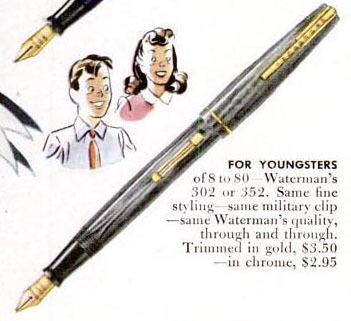 The Commonwealth version has two bands, to distinguish it from the Dauntless 302, which one takes to be a lower-priced version of almost exactly the same pen with a single band; the catalogues I’ve found with the Dauntless in it don’t have prices. The fact that the Dauntless looks like the US Stalwart tends to make people swap the names; I struggled along for quite some time thinking my Canadian Stalwart was in fact a Dauntless. It seems that in the US, the difference between the two models comes down to plating (extrapolating from an ad that apparently predates both model names), with the less expensive Dauntless sporting chrome rather than gold trim. Two bands, non-US imprint is a Stalwart. One band, US imprint is also a Stalwart as long as it’s got gold on it. Of course, to say anything about Waterman’s catalogue with this much confident emphasis is asking for trouble. Check in often for updates. At this end of the price range, there are some cost-cutting measures. The fit of the rivets that hold that clip down is to me the most obvious “discount” indicator on these pens; they frequently look like someone was being trained how to use the machine. The points are essentially still the same ones that Waterman had been making since the turn of the century, so there’s nothing wrong in the writing. Point: 14k gold. There don’t seem to be any Taperite models. Filler: Lever, capacity approx. 1.0 ml. Waterman Stalwart, Canadian variant. The big dumb unboxed lever, similar to that on the Champion, suggests to me that this is a late model, but don’t take that as a fact.